vcCommerce users may now benefit and increase exposure by utilizing our new Site Seal program. Gain customer confidence, increase sales/conversions and improve your sites search engine standings! Customer lack of confidence, security issues, trust issues and identity issues can all be huge barriers when attempting to operate a successful ecommerce store online. We realize these issues and want to do everything that we can to help you succeed. By helping you succeed, we also help the consumer by providing that "peace-of-mind" that they are seeking. 7. No insecure or illegal credit card storage methods being used or in place. 8. No insecure payment modules installed/in use. 9. Site must be PCI DSS compliant (PCI and Enhanced seals). 10. All Site Seal link codes must remain in original form and may not be altered in any way. 11. 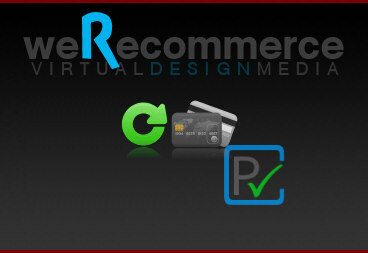 Merchant agrees to clearly post refund/return policy and to work with Virtual Design Media in any event of claim filed. - Credit system allows you to purchase and use when needed. - Activation takes place when you need it so time is never lost. or with any PCI DSS compliant hosting package. 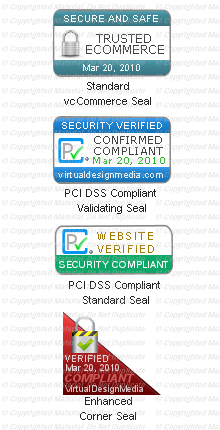 Site seals demonstrate your commitment to security! Studies prove that customers feel safer and are more willing to purchase from a site that displays legitimate trust seals!